..Phil the Parachute Packer (how did Pete miss this alliteration opportunity) appeared after flying to make sure we know how to put on our parachutes correctly. Sounds easy – hm. Get it wrong and descend lopsided (resulting in the turning) or fall out of the harness (result somewhat more uncomfortable). Many thanks to Phil. 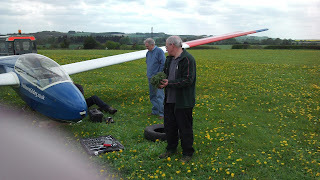 The airfield was sporting its first haircut of the year (well, partial haircut) which resulted in an unexpected problem. After landing and coming swiftly to a standstill, Paul P checked the wheel box to find it bunged up. Poking around with a screw driver had little effect so the wheel was taken out and this is what was found (the grass, not Nigel or Colin’s legs).